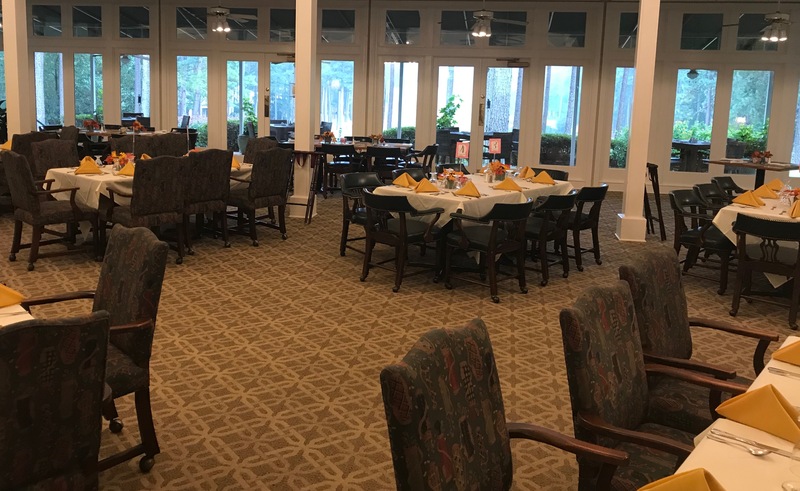 Pinewild Country Club of Pinehurst cordially invites our Members and Guests to explore the culinary offerings provided by our international staff of employees. Pinewild’s culinary team is led by Executive Chef Todd Martin a graduate of Sandhills Community College. He was trained in Classical French and Italian Cuisines. He was previously employed by Casimonca Hotel, St Augustine Florida and The Tower Club, Ft. Lauderdale Florida. Service includes regular ala carte Lunch Tuesday through Sunday, weekend Breakfast November through February, various evening Dinners and Bar/Snack Bar service seven days a week. Member Dinners are typically tied to various themed events…like Valentine’s Day, Trivia Challenge Nights, St Paddy’s Day, Thursday Night Dining, various Couples Golf Event Dinners, Super-Bowl Party and much more. Additional “Grand Ball Room style” Brunch Buffets are hosted for Easter and Mothers Day. Pinewild Country Club of Pinehurst hosts numerous non-member events. These range from smaller intimate parties in the Holly/Gary Player Room, to larger gatherings in the “main” Magnolia Dining Room. These venues are perfect for special occasions like weddings, anniversary parties or company outings.